The Failed Obama Administration™ has raised its own forecast deficit from seven trillion to nine trillion dollars. Keep in mind, deficit is the annual shortfall. Debt is the total of accumulated deficits. GDP, the total value of everything the US makes in a year, is fourteen trillion. The accumulated total amount owed, as of passage of the spendulous bill, was “only” twelve trillion. Unemployment is up in over half the States, but AP puts that after the comma, in a position of reduced importance. The ordinary reader will walk away with a notion that unemployment has dipped. Read more about Is This Bias? In February, when the current President was bashing the economy to sell the spendulous bill, I observed there were still 142 million Americans going to work. Last week we were told unemployment dropped .1%, but even Big Media reported the drop was due to people falling out of the labor force, not because more people were back to work. Total employment was slightly over 140 million. Late last night CNN interrupted its regular drone with a breaking story: Japan Emerges from Recession. They played it up a like an airplane crash or celebrity arrest. They even had to rouse a financial correspondent from sleep to get up-to-the-minute commentary over the phone. Faintly optimistic-sounding news about a government statistic from a foreign economy has become sensational. Although credit was given to the Japanese government’s stimulus spending, the reporter failed to grasp the (in)significance of figures showing Japan’s domestic demand had continued shrinking. The reported growth was entirely from exports. If anybody’s stimulus is responsible, it must be the Chinese. They’re the only big player still growing demand. Despite persistent efforts of politicians and pseudo-news organizations like CNN to proclaim the economy has “turned a corner” and is “getting back on track” (someday I’ll have to rant about vapid economic metaphors), the US stock market reacted to this phenomenal news by dropping 186 points (2%). Yes, it is “over the top”. But it makes the point plain, while staying true to the reasoning behind it. We’ll be seeing a wave of reports about the dangers of petroleum-based fertilizer. With global warming running afoul of the evidence, and since peak oil paranoia never caught the mainstream, the do-gooders who seek control need a fresh angle. Even if we switch to a “new economy” of wind and rubber-band power for harvest and transport, the evil oil interests can starve us to death as long as we depend on industrial farming and fertilizer. We must mandate an organic/sustainable agriculture policy IMMEDIATELY. President Obama says the country has "stepped back from the brink" where the economy is concerned. The president says the U.S. economy has turned the corner. He made the positive remarks on the day his $787 billion stimulus plan turned one hundred days old at a meeting with major donors in Beverly Hills, California. "When you look at the economy right now, I think it's safe to say that we have stepped back from the brink, that there is some calm that didn't exist before," Obama said. Last year we saw what happened when government enticed farmers to turn corn into motor fuel. The price of food went up. The price of raw sugar has increased to its highest level since 1981, as supply concerns grow. Growing demand in Brazil for sugar to be turned into ethanol, coupled with a sharp fall in Indian production, have both prompted worries, he explained. The mandated “alternative energy economy” will make us prisoners of geography by raising the cost of travel. Or, we’ll just starve to death. 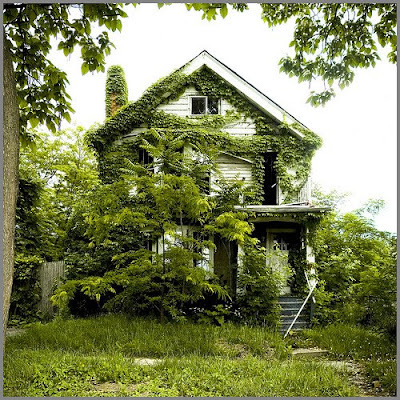 Among the abandoned houses of Detroit, the lucky ones aren't burned completely or bulldozed, but allowed to be consumed by the foliage once meant to beautify them. What people call “credit card companies” are really just banks. The largest issuer of credit cards is Bank of America. JPMorgan Chase and Citigroup—2nd and 3rd largest issuers—are banks. Using the label “credit card companies” creates a false distinction. There is not some shadowy, specially-evil class of corporations preying on poor little consumers. They’re the same companies that cash paychecks and pay interest on old-fashioned savings accounts. Not all card issuers operate retail banks—you can’t deposit a pile of loose change at the local American Express office. Discover and Amex are just banks without storefronts. If you can't get insurance because of a pre-existing condition, you don't really want insurance. You want someone else to pay your bills. Insurance is about sharing risk of the unknown. A pre-existing condition is known with certainty. People with asthma or diabetes, for example, need medicine to maintain a quality of life similar to those without such afflictions. Inhalers and insulin are more ongoing necessities—like food—than one-time catastophes like a kidney transplant. Although the term is in common use, my experience as a local crime-fighter has taught me there is no such thing as a criminal justice system. The term “system” implies a coherent integration of activities which does not exist. Lawmakers, police, prosecutors, courts, prisons, and probation departments have overlapping interests, but are independent bodies. This is most commonly witnessed as a revolving jailhouse door, where an offender is arrested, charged, released, and then arrested for the same offense, often within days. If this were a system, it would be a failed system. “No business wants to invest in a place where the government skims 20% off the top. No person wants to live in a society where the rule of law gives way to the rule of brutality and bribery. The economy has changed drastically since the tycoon last year called for the United States to cut back on its oil imports in the face of record-high prices and said he planned to invest $10 billion in wind power. McDonald’s holds high station in the pantheon of evil global corporations. As seen by the righteous leftoids. Not only do those tasty fries make us fat against our will, the Big Mac has soiled the sacred cuisine of France. I’ve followed some discussions which propose that health care in the US is costly because we have the money to pay for it. There are only so many yachts one can water-ski behind, and preferences shift from collecting goodies to prolonging life and the ability to enjoy it. It’s parallel to the idea that people become concerned about the environment only after they have worked themselves away from the edge of starvation. I like where the thinking leads, as it turns the problem on its head. High costs are not a symptom of dysfunction, but a sign of prosperity. There certainly are inefficiencies to root out, and moral hazards to avoid, but we start not as victims, but beneficiaries. The Federal Reserve on Wednesday said the recession is easing, but that the economy likely will remain weak and keep a lid on inflation.